IsaiahThomas is a Legacy Library. Legacy libraries are the personal libraries of famous readers, entered by LibraryThing members from the Legacy Libraries group. » Isaiah Thomas's legacy profile. IsaiahThomas is also an author. » See Isaiah Thomas's author page. 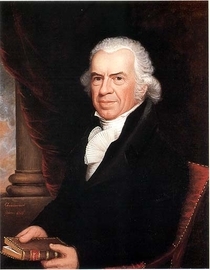 About meIsaiah Thomas (19 January 1749–4 April 1831), founder of the American Antiquarian Society, printer, publisher, and author of The History of Printing in America (1810). This library formed the core of the original collections of the American Antiquarian Society. About my libraryThis catalog contains the library of Isaiah Thomas, as documented in an octavo volume titled "Catalogue of The private Library of Isaiah Thomas, Senior, Of Worcester, Massachusetts. Taken in March, in the Year 1812." On a preceding leaf, Thomas writes "The following Catalogue of Books is presented to the American Antiquarian Society, to be the exclusive property of said Society to all intents and purposes so long as it shall continue a body corporate, pursuant to the provisions of the Act of incorporation of said Society. By Isaiah Thomas, Worcester, July 12, 1812." On the same page, in a note dated July 9, 1812, he estimates that the books within are valued at a total of $5,000, noting "In my estimation none of the Books are charged high - many below the Cost." On the verso of the title leaf Thomas adds another note: "1820. August 18th. Since July 12, 1812. when the Books in this Catalogue were presented to the American Antiquarian Society by Isaiah Thomas, he has given an addition, which are valued at about 5000 dollars, in all 9000 dollars." The transcription of Thomas' catalogue and the valuable citation information included in the Comments field of each record were the work of Marcus A. McCorison (1926–2013), the librarian, director, and then president of the American Antiquarian Society from 1960 until his retirement in 1992. The vast majority of McCorison's annotations are given as they existed in his final draft version of the catalogue, though obvious errors have been corrected where found, and in several instances editions unlocated by McCorison have been identified in the intervening period. McCorison assigned each entry a specific number, which are listed in the "Dewey/Melvil" field to permit sorting (these are also given with the full citations in the Comments field). Sorting on this field will present the catalog entries in order as given in the manuscript. Holdings information for copies at AAS has been added in the Comments field, whether or not the copy is currently identified as that given by Thomas. The AAS call number, where available, is listed in the "LC Classification" field. - Orations, on Independence, Death of Gen. Washington, &c.
In testimony whereof I have hereunto set my hand and Seal, this twentieth day of September, in the Year of our Lord, one thousand eight hundred and thirteen." In 1821, Thomas gave another portion of this library to the Antiquarian Society, documented in the same volume and headed "Catalogue of the Remains of The Library of Isaiah Thomas in 1821. After having given about 9 tenths to the American Antiquarian Society, among which were most of his choicest and best Books. This Catalogue consists of about 450 Volumes, Augst. 1821, & probably will be enlarged." Books given in this gift are tagged "Remains of Library (1821)." More than 500 books not listed in this catalog but currently identified as Thomas' in the collections of the American Antiquarian Society have been included here, using the "Later Gifts" tag. These have "NIM" (for "Not in McCorison") in the "Dewey/Melvil" field. Books which are cross-referenced or for which additional copies appear in the catalogue may have multiple tags, but only the relevant tags specifically used by Thomas have been included. Almanacks and newspapers have been combined into chronological and state-based records, respectively. Please note that the volume count reflects more closely how the books are currently cataloged than how they existed when Thomas cataloged them; many previously bound-together pamphlets are now separated, &c. The volume count for this library thus should not be considered an accurate count of how many volumes existed in Thomas' library. Questions? Concerns? Corrections? Know of a Thomas book which should be added? Please contact Libraries of Early America coordinator Jeremy Dibbell.